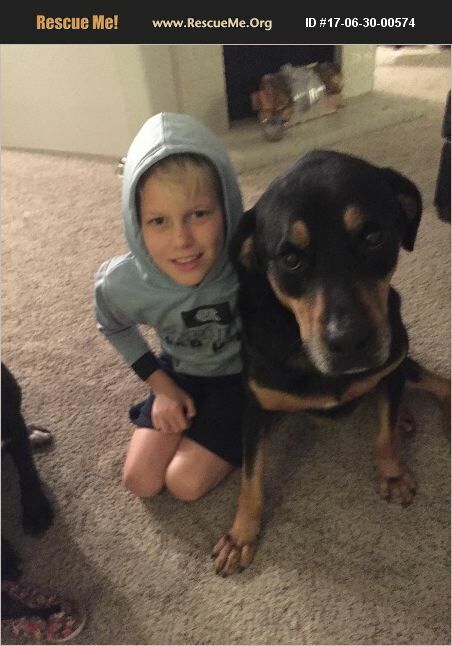 Texas Rottweiler Rescue View other Rottweilers for adoption. Bruno is a sweet, loving, loyal dog who is wonderful with my two young children (5 & 8 years old), all ocelot friends, and two other dogs (lab mix and min-pin mix). He is not the alpha dog in the house, the lab is. We used to have a cat, who he was interested in, but never hurt. He can be protective, but is also scared of thunder and vacuum cleaners. So why does such a wonderful dog need a new home? There have been a couple of incidents in my neighborhood where another dog has been slightly aggressive and Bruno has ''put them in their place'. Needless to say, this has resulted in complaints and fear from my neighbors. I have no choice but to find him a new home, and the idea of putting him in a shelter makes me sick. If you would like to meet your new forever friend, please contact me!